Storming the fort: And thus, I stood outside Fort Roberdeau. I stood outside Fort Roberdeau, because I didn’t have enough money to get in. The Hubs to The Preschooler: What comes from cows? I also saw the movie Lincoln this weekend. I’m probably the last CIvil War fanatic on the planet to see Lincoln. The Hubs and I, in a stellar display of laziness, just never got around to watching it. And, can I just say, it was phenomenal. I’m sure you know that, because I’m sure you saw it last year with everyone else. But guys, Tommy Lee Jones? National treasure! James Spader? Scoundrel! Joseph Gordon Levitt? Not on-screen nearly enough! Hal Holbrook? Hal Holbrook! Daniel Day-Lewis? No words. My brain will never be able to picture Lincoln in any other way, shape, or form. And Sally Field was everything I wanted Mary Todd Lincoln to be: crazy. Sassy. Fabulous. With History Mode engaged and in the fully locked position, we decided to leave The Rowdy Boys with my in-laws and take a little jaunt to Fort Roberdeau. 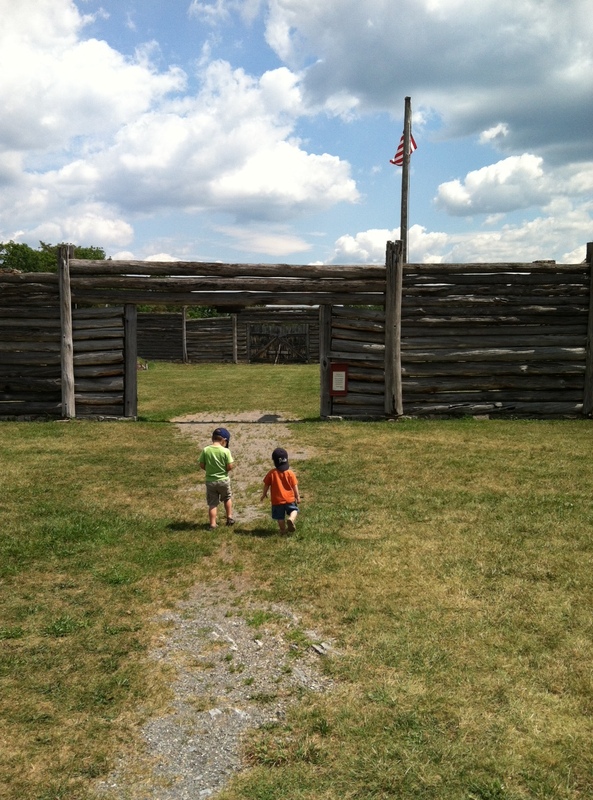 Fort Roberdeau has nothing to do with the Civil War. This is Blair County, Pennsylvania. If you want Civil War you have to get in your car and drive to Gettysburg. 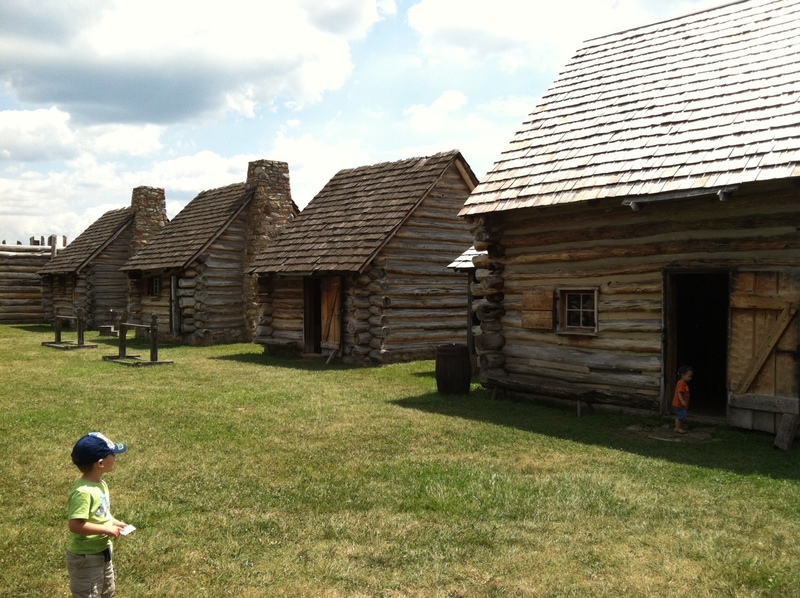 Fort Roberdeau was built in 1778 to protect the lead mine operations in the so-called “Sinking Valley” in Blair County. It was never attacked, but did offer safety for militia, miners, and townspeople. Most frontier forts of the period are built with vertical logs, meaning, a trench is built and the logs basically planted in the soil. The soil in this part of Pennsylvania is rocky and scant. It’s nearly impossible to build an adequate trench, so the fort was built with horizontal log placement. 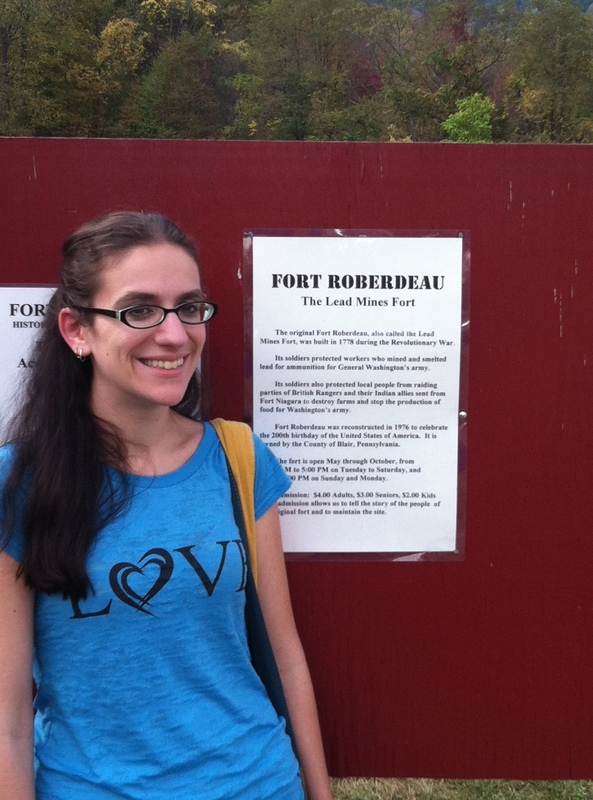 Here you see me standing at the entrance to Fort Roberdeau. This is as far as we got. Actually, we got all the way up to the gift shop before we saw the itty bitty, teeny tiny little sign: cash or check only. I had two dollars on me and assorted amount of change. The Hubs had a Sheetz coffee Punch Card. The “grounds” consisted of the strip of grass we’d crossed to get from the car to the bank barn that housed the gift shop. But we politely smiled and thanked her and took a brochure. The Hubs and I get inexplicably jumpy when people reenacting outside our time period (I’m quantifying the 1860s as our time period) start talking about authenticity. I’m a little bit rusty on my 18th century…well, anything 18th century, but I can spot modern jewelry at 10 paces. And a dog tag chain around her neck was decidedly non-18th century. Unless it was a medic alert necklace. Hmm. My dad wore a medic alert necklace for almost his entire life due to a reported penicillin allergy. I say reported, because when he first became ill and my grandparents flew up to Florida when he was in the hospital, he made a comment about his penicillin allergy. My grandma looked at him and said, “You’re not allergic to penicillin.” So, we don’t actually know if he was allergic. And that has nothing to do with anything. Anyway, so I got to look at the fort from the parking lot. And if I hadn’t been so thirsty and demanding The Hubs drive to something resembling a metropolitan area to buy me a beverage (who knew Altoona was that big? I didn’t know), I’d have taken a picture of the fort from the parking lot. But I didn’t. Luckily, The Hubs went the fort back in August when I was on the cruise. He generously offered a few pictures from his trip to go with my blog post since, you know. I saw the outside of a wall. And yes, those adorable little travelers you see strolling up to the fort are The Rowdy Boys. Apparently, they only lasted ten minutes before they got bored. I can in no way describe anything about these two pictures. Looks like some buildings. If you live near Fort Roberdeau or happen to be passing through Altoona, it’s probably worth a stop–as long as you have $4.00 in cash per adult and $2.00 in cash per child. Here’s a link to their website. Also interesting. Oh, and fun fact from The Hubs: supposedly, the lead mines that Fort Roberdeau was protecting have been lost to history. Nobody knows their location or what happened to them. I should point out that Fort Roberdeau is a countr run park, so it’s not affected by the government shut down. Go to your county parks! Go to your state parks! There’s still history to be had, just not…you know, federally endorsed history. South Mountain Battlefield (near Antietam) is state-run. Fort Pitt in Pittsburgh is actually run by the Heinz History Center (I think), but the fort’s blockhouse is technically still owned by the Daughters of the Revolution. I didn’t even know the DAR was still out and about, running things. I also didn’t know that there are still children of Civil War soldiers living and collecting federal pensions for their father’s service, but apparently there are. Like two. But there you go. That’s mind-boggling. And finally, for those keeping score, I only managed to write like, half a page this weekend. And not on Random Contemporary. 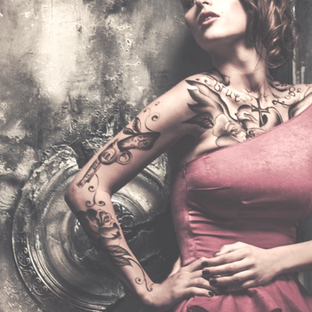 I had a flash of brilliance for the historical novel that’s been smoldering on the back burner for a while and took a few minutes to type it out. But, now that that’s out of my system, it’s back to Random Contemporary. For now. I’m still on the fence if I want to participate in National Novel Writing Month this year. Putting my work in progress down for a day to jot down some idea for another book is one thing, but putting it down for a whole month….I mean, come on. For as distracted as I am, I’d probably forget to go back to it and end up getting obsessed with whatever new project I started. Because that happens enough on its own as it is. I signed up for a version of NaNoWriMo, and I break out into a cold sweat when I think about it. I really do need to learn to write faster though and stop worrying so much about making the first draft nice and orderly. If you do participate, I wish you good luck! Tell me about it–I was thinking about it at lunch today and began worrying about reaching page number goals. Next month. I’ve always been a crazy, first draft pusher. In college, I always turned in my first draft. I’m trying to break myself of that because it’s turning me into a slow writer. Example: today at lunch, I had 15 minutes to spare so I decided to work on Random Contemporary. I wrote two sentences. They’re delightful little sentences, but holy cow. I should have at least squeezed out at paragraph. Heck, I squeezed out a child in less time than that!!! The necklace is a county ID card necklace. It was nice of you guys to come by, I am sorry you did not get a chance to come in. Aaaahhh–mystery solved! It’s actually a relief, because I’m out of control for authenticty and accuracy. We’ll definitely be back, since we’re often in the area but I don’t think we’re going to make it back in time for the Market Day. Which is a bummer, because deep down, I’ve had a secret interest in Rev War reenacting for several years. Thanks for stopping by! I am completely onboard with that! I need something to kick me into gear; currently I’m distracted with comma placement and perfect sentences. And, completely unrelated to any of that, HUGE congrats about Uwe (although, I’m not a bit suprised because Yellow Bike had me floored on synopsis alone) and even bigger congrats and hugs for Google’s debut! He’s adorable! Thanks! If you make a Nano account, I want to be a writing buddy!